The human BRAF gene is involved in the RAS-RAF-MEK-ERK signal pathway and plays an important role in regulating cellular responses to extracellular signals. Frequent somatic mutations of the BRAF gene have been detected in various types of human cancers such as malignant melanoma, non-small cell lung cancer, colorectal cancer, papillary carcinoma of the thyroid, ovarian cancer and hairy cell leukemia. Among all mutations, a single point 1799T> A (V600E) transversion represents the most common mutation of BRAF. This mutant has increased kinase activity and serves as a driver mutation in several types of cancer and confers increased sensitivity to tyrosine kinase inhibitors. 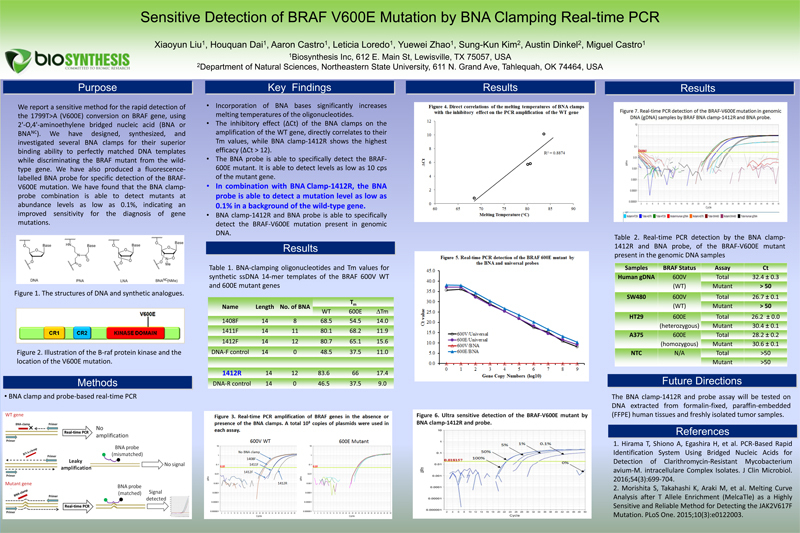 The “Ultra Sensitive BRAF Codon 600 (V600E) Mutation Analysis Kit” incorporates Bridged Nucleic Acids (BNA) for the rapid and convenient real-time PCR detection of the BRAF-V600E mutation with high sensitivity. The kit is able to efficiently discriminate the mutant from the wild-type gene. It allows laboratories to detect levels down to 0.1% or lower of the BRAF V600E mutant in a wild-type background. Unlike other detection technologies that utilize narrow delta Ct values to determine the presence of a mutants, the wild-type gene is not flagged by the “Ultra Sensitive BRAF Codon 600 (V600E) Mutation Analysis Kit”, thereby avoiding false detection of the wild-type gene. Therefore, the kit offers a highly specific way to detect the mutant. In addition, the presence of the mutant can be easily determined, since it is the only template that appears to be detected. Figure 1. 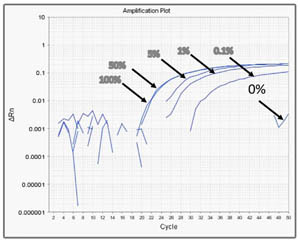 Real-Time PCR Assay for the Amplification of BRAF-V600 WT and V600E Mutant Template by BSI “Ultra Sensitive BRAF Codon Mutant (V600E) Analysis Kit”. Figure 2. Real-Time PCR Assay for the BRAF-V600E Mutant in V600 WT background using BSI “Ultra Sensitive BRAF Codon Mutant (V600E) Analysis Kit”. The Ultra Sensitive BRAF Codon 600 (V600E) Mutation Analysis Kit (25) has a shelf life of 6 months under proper storage condition.